Available with either a 4" stainless steel serrated edge or plain edge blade, this lightweight and simple fixed blade could be a good choice if weight is a concern. 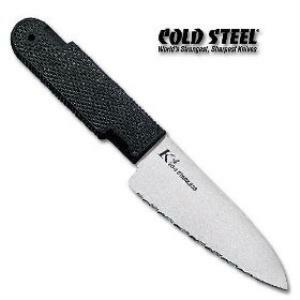 The total weight including sheath and lanyard is only 3.7 ounces. The Kraton textured handle offers a secure and comfortable grip for light camp work as well as emergency use, so as a knife for a hiker or a fisherman this combination makes some sense. Designed to be work around the neck and loose, rather than in the fixed position ninja style (behind the neck, below the collar), in real life this might not be as easy to find as it appears in the advertisement. Sewing the sheath in place somewhere on the inside of a jacket, so you could always find it, seems a better idea. One of the lightest fixed blade knives of this size that you'll find, the sacrifice in weight has resulted in a very thin and flexible blade (1.5 mm thick). For heavy work that won't be enough. This is a bare essentials style, not the kind of blade you'd choose for general camp work, but light enough to lash conveniently to your gear and wear inconspicuously on the trail. I can't foresee any circumstance where I would wear it on the necklace. OK, maybe if I were posing for the ad.